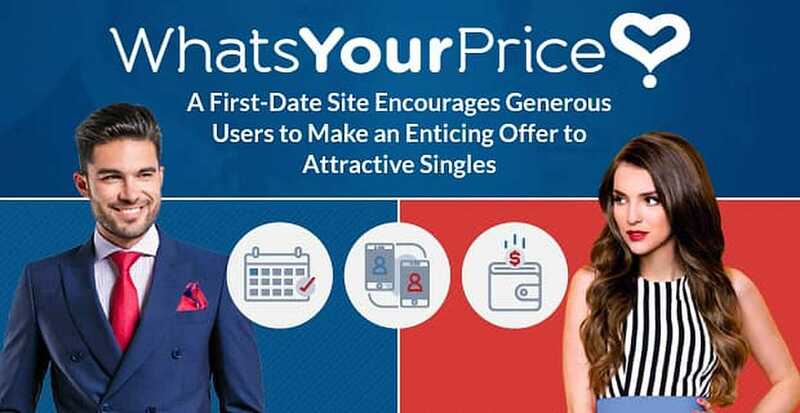 The Short Version: WhatsYourPrice.com, a groundbreaking dating site, helps single men and women arrange a first date as quickly and effortlessly as possible. Instead of sending messages or swiping right, singles introduce themselves by making an offer of what they’re willing to pay or be paid to go on a first date. The average date offer is $125, but it’s up to each individual to negotiate and determine their own value. Once you’ve agreed on the price, you and your date can use the private communication tools to plan a mutually beneficial first date with no muss and no fuss. Attractive members (who want to get paid for a date) don’t have to pay to chat or wink on the dating site, and generous members (who want to pay for a date) use credits to make an offer and win the favor of people online. On What’s Your Price, over 2 million singles have made more than 4.8 million bids for first dates with someone worthwhile. Balancing parental responsibilities and a personal life is one of the most difficult parts of being a single parent. Between running errands and serving dinners, when do you squeeze in time for some adult fun? Free time doesn’t come by very often, and, when it does, single parents may not have the means to make the most of it. However, one 23-year-old single mom has found an extraordinary dating solution that works for her and her family. She’s become an active member of WhatsYourPrice.com, a sugar dating site that facilitates first dates. On the site, generous members offer money to entice attractive singles to agree to go on a date. When the 23-year-old finds someone she likes, she negotiates for a one-time fee and uses the money from her date to pay for a babysitter, which frees her up to have a good time. What’s Your Price is a straightforward dating platform geared toward setting up fantastic first dates. Launched in 2010, What’s Your Price empowers singles, like the 23-year-old mom, to get into the dating scene and increase their quality of life by being upfront about their needs and desires. It’s free to join, set your price, and meet your match. So far, members have made over 4.8 million bids averaging $125. You can cut right to the chase on What’s Your Price and bid on or accept dates with people truly invested in meeting someone special. Unlike most dating sites, What’s Your Price is all about the first date. The platform encourages singles to agree to meet in person without much preamble. Whether you’re looking for a one-time fling or a committed relationship, the site can introduce you to singles who have similar mindsets about romance and love. When you sign up, you’ll categorize yourself as either a generous person (someone who will pay others for dates) or an attractive person (someone who wants to get paid for dates). 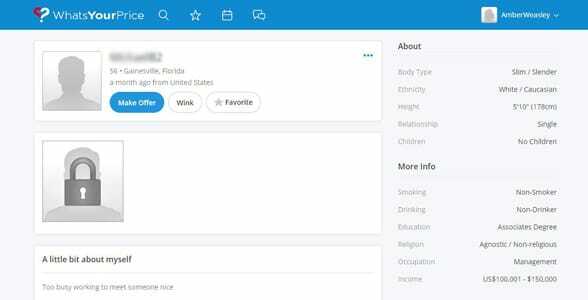 You must also enter basic details about yourself, including your body type, education, occupation, smoking habits, and religious beliefs — all of which will be visible on your dating profile. You can put “prefer not to say” for your income, but all other sections are required. You must also describe yourself and your ideal first date in a minimum of 20 characters. Lastly, you’ll add at least one photo of yourself to complete your profile. You can’t make an offer until you have uploaded a photo. Of course, you can customize your privacy settings to ensure only people you’ve shown interest in can see your pics. What’s Your Price members range in age, orientation, and income levels, but they’re all looking for a shortcut to romance. Once a moderator has approved your profile, you can send a wink or make an offer (typically $125 or more) to anyone you fancy. Generous members buy credits to unlock communication tools, while attractive members can wink, favorite, and chat for free. Over 2 million members have profiles on What’s Your Price, and you can sort by location, age, height, and other dating preferences to find someone who’s right for you. You can feel confident on this platform that the people you meet are genuinely interested in meeting someone on a date. What’s Your Price provides users with background verification tools to keep things on the up and up, and you can always report or block someone bothering you on the site. What’s Your Price has been making headlines in the sugar dating scene since 2010, but its recent shift toward first-date bidding has been a game changer. In late 2017, the dating site began focusing on facilitating first dates between singles who know exactly what they want. 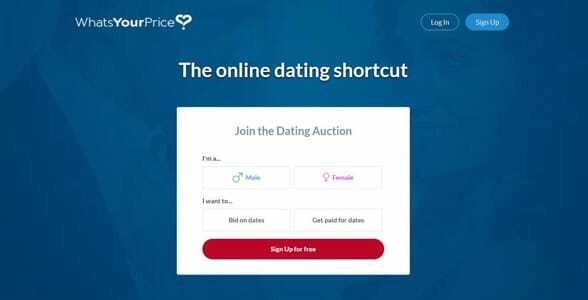 The site’s tools allows users to suggest a first-date price, make a counteroffer, and negotiate a mutually agreeable arrangement for every introduction. The typical date offer is $125 nationwide; however, some of the most generous cities have average offers of $400 or higher. These numbers have been on the rise as more people sign up for What’s Your Price and start bidding wars for first dates. Verified members can make an offer for a first date using What’s Your Price’s simple tools. If you’re curious about how short-term dating works, joining What’s Your Price is a great way to see what it’s all about and meet self-confident singles in your area. Maybe you’re only in town for business and would like to go out to dinner with someone other than your coworkers. Maybe you’re a student on a tight budget and wish you had the means to have more fun in your free time. Whatever your situation, What’s Your Price offers a simple solution to increase the number of dates you go on on a weekly basis. Over the years, the What’s Your Price team has heard many stories from people who’ve used the site to better themselves and their lives. Many individuals have been able to pay off student loans, finance trips abroad, and take care of themselves and family members thanks to the date offers available on the site. One woman donated her kidney to someone in need and used the money she made from dating on What’s Your Price to fund her recovery. Another person made enough extra cash to help put herself through nursing school. Whatever your ambitions are, What’s Your Price is a lucrative and enjoyable space to meet people who support your life goals. Instead of burning members out with dates that don’t go anywhere, What’s Your Price allows people to take things to the next level in a short period of time, opening up a world of romantic and financial possibilities for people of all backgrounds. This cut-to-the-chase, make-dating-easier system is incredibly popular among today’s singles. In the last few months, What’s Your Price has seen steady gains in membership and activity on the site. What’s Your Price’s innovative dating system takes the pressure off singles who meet online. No more long back-and-forth conversations that go nowhere. No more wondering if your crush will agree to the date. You can set your price, tempt a local single, and arrange a face-to-face, real-life, and no-strings-attached first date. The dating site helps you get someone to agree to go out with you, and then lets couples take it from them. This streamlined first-date process makes dating more affordable for attractive singles and more efficient for time-conscious singles. Whether you’re a single parent with a lot of dating-related expenses or a single professional with high personal standards, you can state your value and go after what you want on What’s Your Price.